I am fascinated with Second Life. For the uninitiated, Second Life is a popular virtual world. 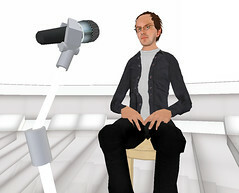 Wikipedia describes a virtual world as "a computer-based simulated environment intended for its users to inhabit and interact via avatars. This habitation usually is represented in the form of two or three-dimensional graphical representations of humanoids (or other graphical or text-based avatars). Some, but not all, virtual worlds allow for multiple users." Second Life is populated with actual people and organizations. You can buy and develop real estate and property with the development tools that are provided for you. You can conduct actual transactions in Second Life. From the Second Life web site: "commerce is handled with the in-world unit-of-trade, the Linden dollar, which can be converted to US dollars at several thriving online Linden Dollar exchanges." The company that runs Second Life is Linden Lab, thus the Linden Dollar. While fascinating, I don’t link Second Life is yet ready for prime time. You have to download and install software to use it, there is precious little guidance about what to do when you enter the world, let alone find any interesting destinations, and the graphics are clunky. But when they improve on those things and get the game to run in a browser so you don’t have to install software, Second Life has fantastic potential. The marketing opportunities an easy-to-use and widely popular virtual world presents are limitless. Organizations such as Reuters, BBC Radio 1, and Wired magazine, Microsoft and Dell and Sun Microsystems, and Major League Baseball have set up shop there. Right now, unless you’ve got tons of cash to spend on development and real world marketing, Second Life seems good for generating earned media, such as Duran Duran’s presence there. The 80s band had been all but forgotten until they generated publicity through Second Life. I recently ran across the video below on YouTube that illustrates the public relations dividends of a Second Life presence. William Gibson is one of my favorite authors. He’s been called a cyberpunk novelist because his stories take place largely on "the grid" and visualize a dystopic future in which the distinction between online and off is practically meaningless. (My favorites of his oeuvre are Neuromancer and Mona Lisa Overdrive . ) Gibson coined the term "cyberspace." 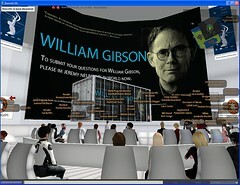 A reading by William Gibson from his new book Spook Country , then, is a perfect fit for Second Life and a perfect opportunity for product placement within that virtual world. But the event also, as demonstrated in the video below, is given a "second life" online, as a viral video that promotes the new book. Product placement can work in Second Life but it can’t be forced; it’s gotta feel natural. In this case, with William Gibson, it makes eminent sense.